Bert's CK Tutorials - For Sale, Sold! 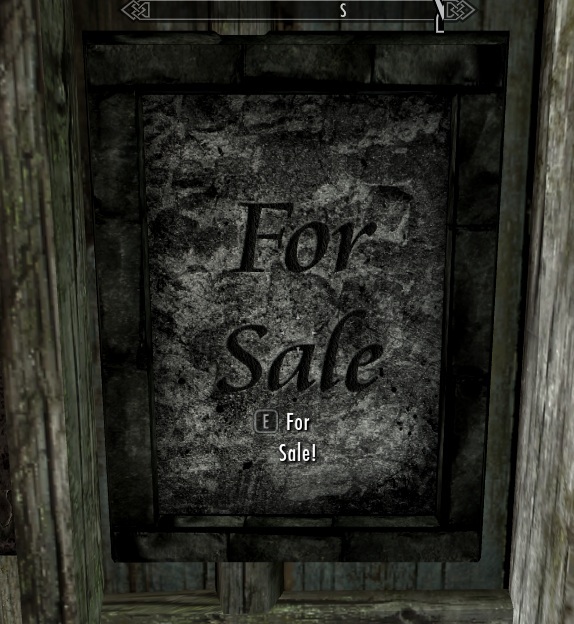 Selling your mod house without having to mess with the steward! 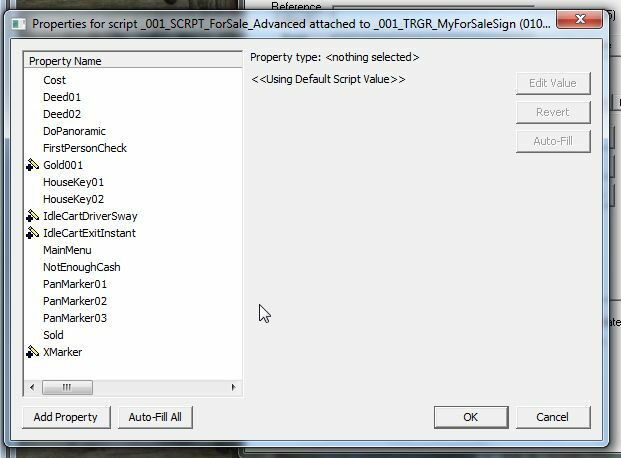 to create a new trigger/activator (see Niffed Triggers Tutorial). 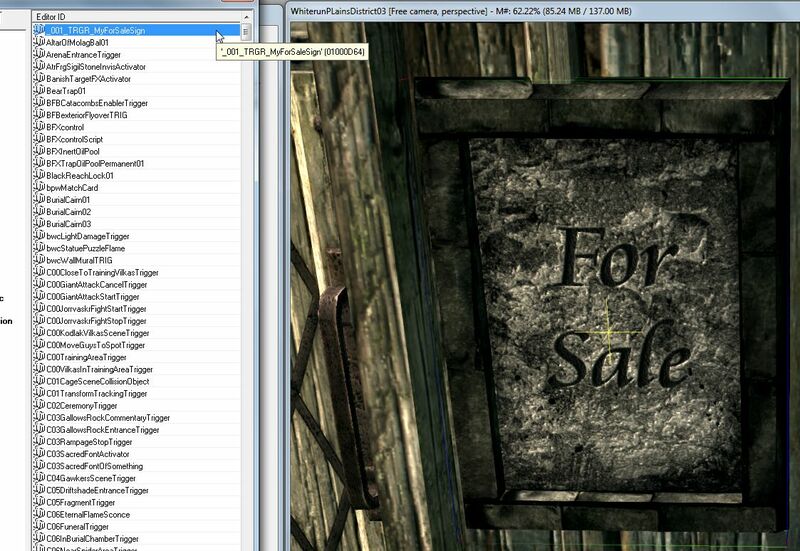 and the textures it uses. 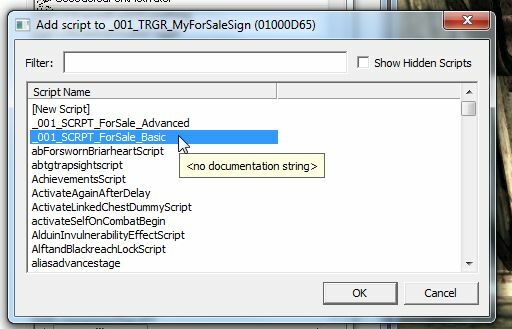 So, to begin you should have your niffed trigger sale sign in place and ready to have the script added to it. 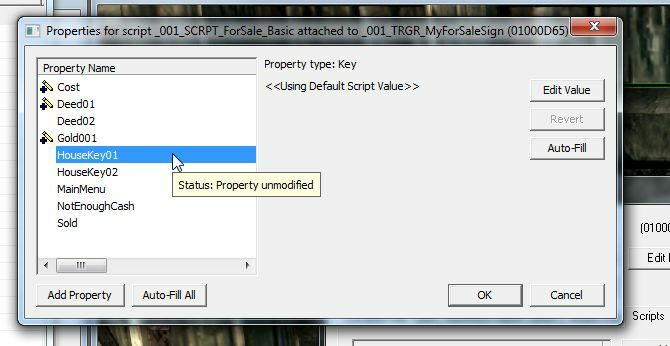 Next, double-click the sign to open it's properties and in the <Scripts> tab click the <Add> button. 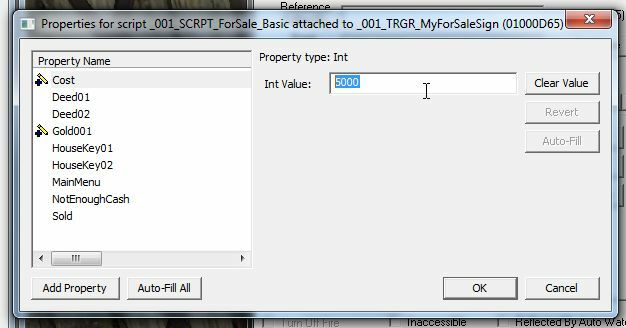 Now with the script highlighted click <Properties>. 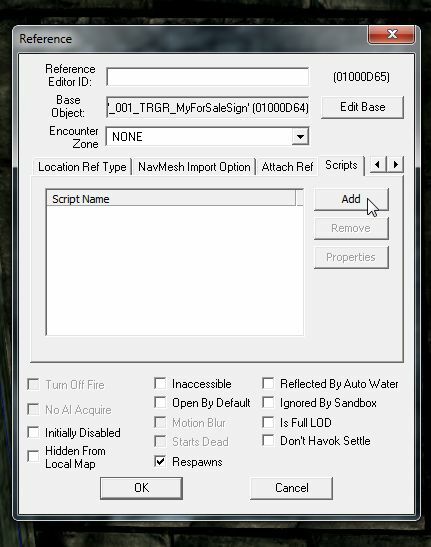 You will now be presented with a new window showing all the options to be filled. 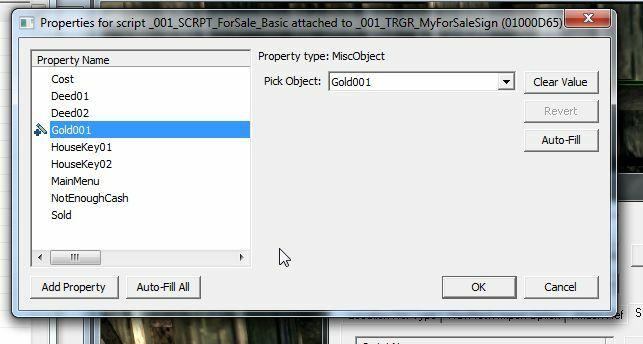 the game knows what object to remove from the player when the house is bought. 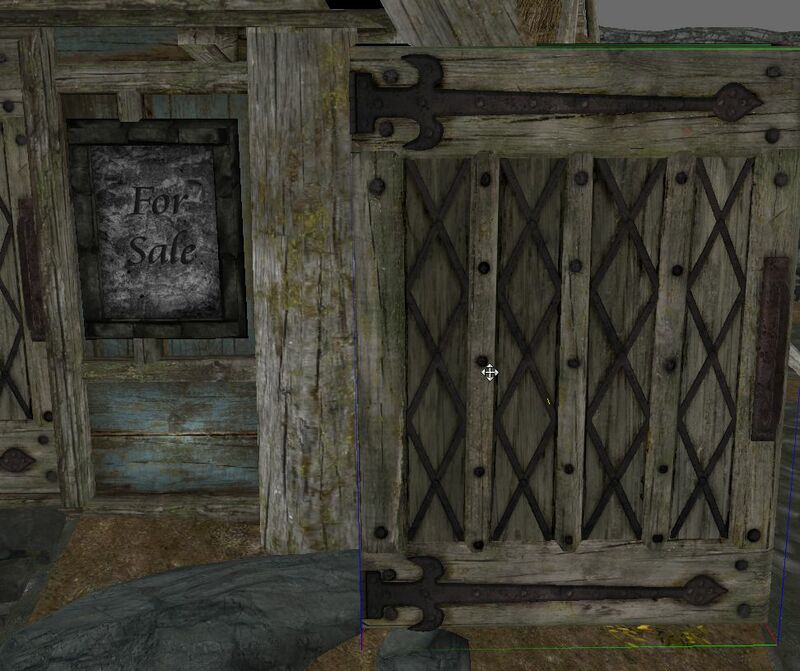 your house will cost the player, I've gone for 5,000 Septims. 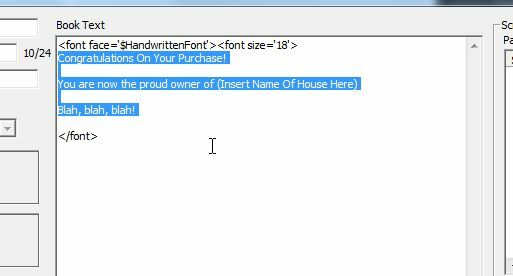 saying you own the property so you can add 2 deeds or 1 deed and a bill of sale, you get the idea. To create a deed find yourself a nice note or book, depending on your preference, I've gone for a gilt edged note. 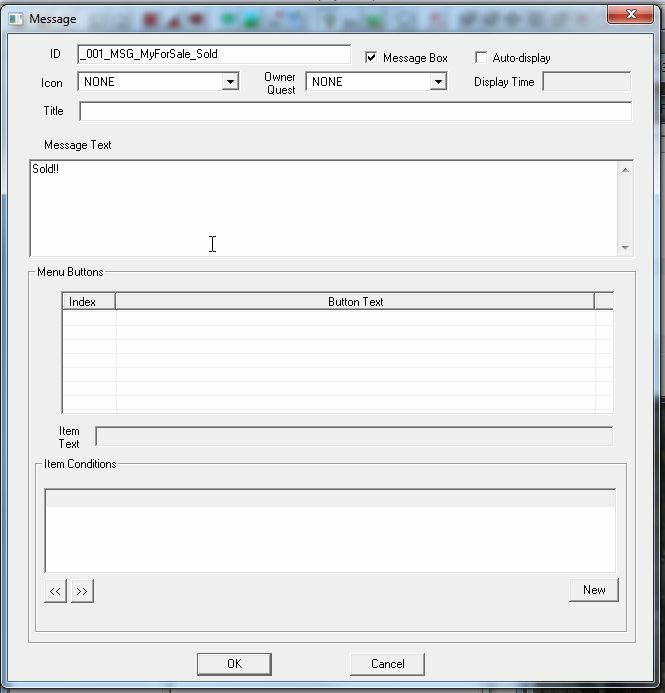 to create a new instance of it. 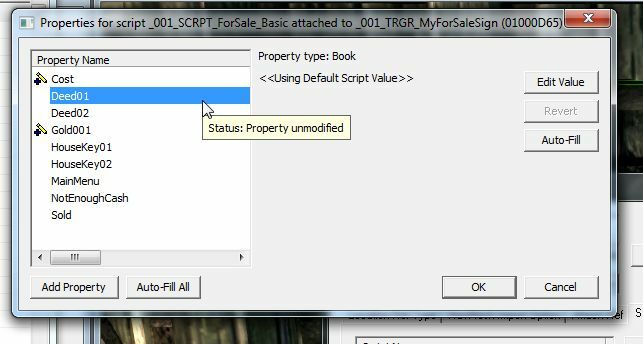 Right-click your deed/bill of sale and select <Edit>. 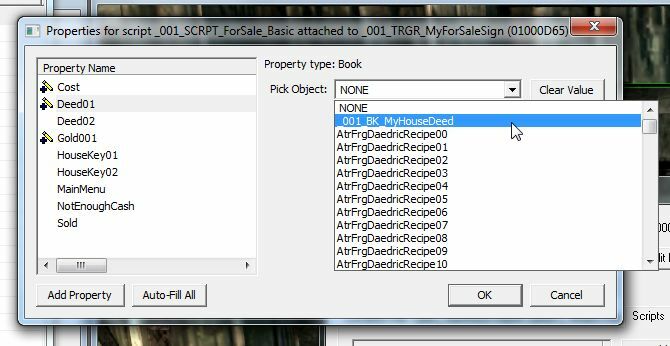 In the new properties window start by giving your deed a unique name, this is the name that will be seen in-game. And replace it with your own text. repeat for the second deed/bill of sale if you wish. or anything else that uses a different key to the house. 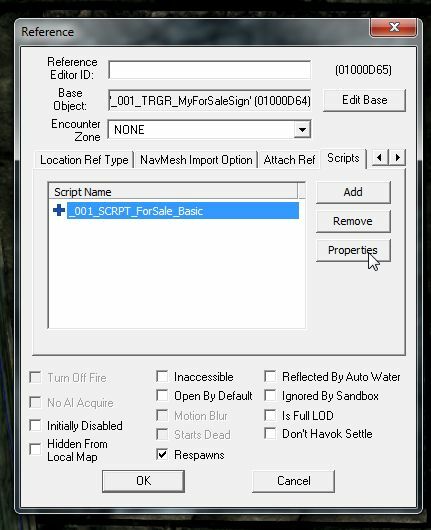 key and edit the internal name to what you wish shown in-game then link it into the script. another and this time insert "No" or "Cancel". 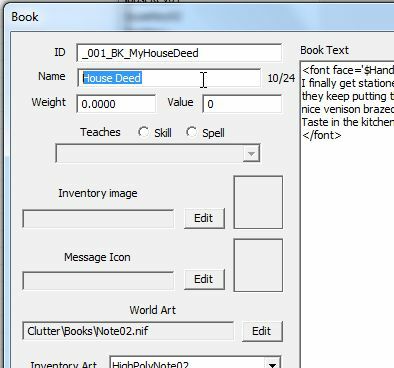 may want to add something like "Deed & Key Added To Inventory" to let the player know he/she now has those items. 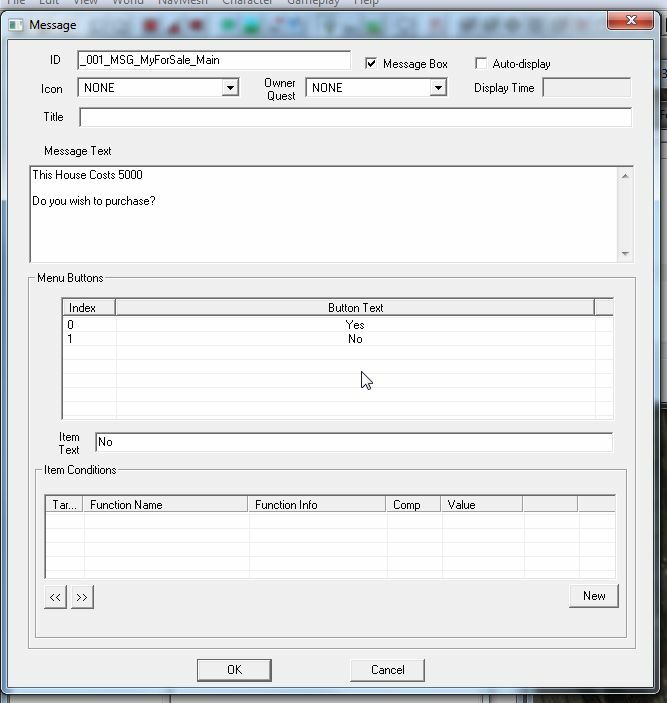 Note, the NotEnoughCash & Sold messages do not need any buttons, the game will automatically supply OK buttons! You should now have your three messages. 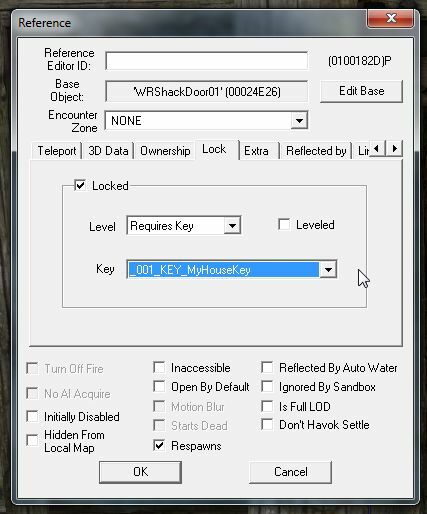 Now all thats needed is to connect your key to your door. I've plonked down a door just to demonstrate this part. 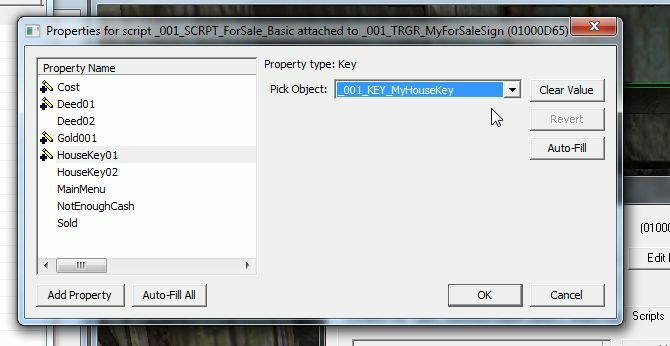 Tick <Locked>, set <Level> to <Requires Key> and in the <Key> drop-down box attach your new house key. Thats it! Go in-game and try it out! sign will appear in it's place! 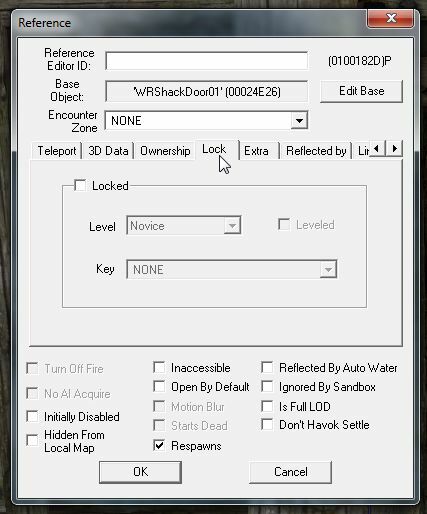 Now for a quick description of the Advanced version and it's setup. jumping all the time if they leave the ground during the circuit. 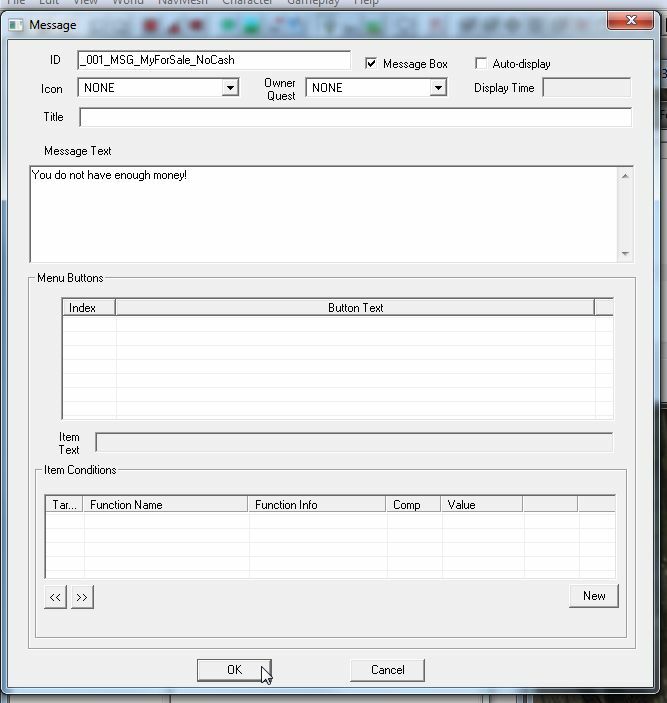 IdleCartExitInstant - This puts them back on the ground once the circuit is complete. the player back where they began. 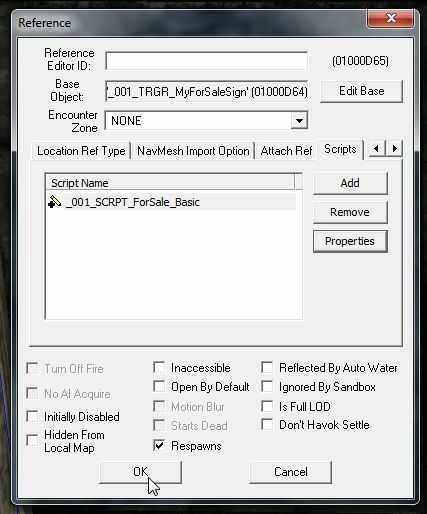 script will react the same as the Basic version regardless of any of the other Advanced settings being set. 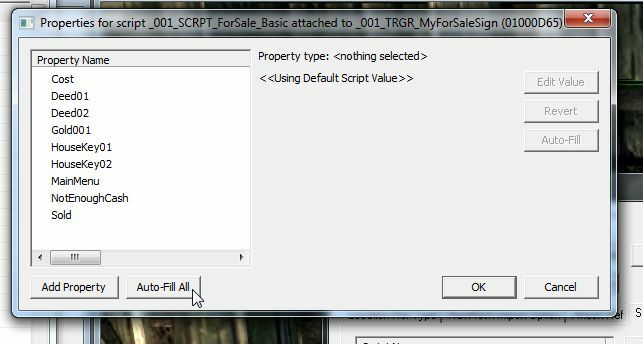 1st Person Check Tutorial for setting this Variable up then assign it to the script. 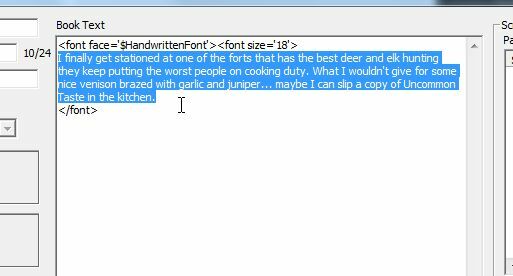 To see how the advanced version works in-game check out my mod Wild Mountain Dairy Farm.